Perry draws his originals on watercolour paper in Indian ink, walnut extract, watercolours and powdered pigments. Each original is photographed professionally in a studio set up specifically for this purpose, using high-powered strobe lighting and a top-end Hasselblad digital camera. A single digital image is approximately 60MB large and can be reproduced to the size of a large advertising billboard without loss of quality. Once photographed, the digital image is opened in Photoshop and adjusted to match the original, based upon the type of paper it will be printed upon; each paper type absorbs ink to differing degrees, thus making colours slightly more, or less brilliant. The giclée prints are reproduced on acid-free art paper, using a professional inkjet printer with 8 inks. The word “giclée,” is a Fine Art term for a print using fade-resistant, archival inks. This increases the colour range and allows smoother gradient transitions than those possible with traditional lithography. Giclées are now commonly used by museums and art galleries. 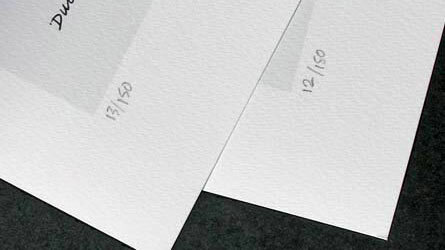 - Satin finish 240 gm white art paper, used for all of his open edition prints. Canvas prints are now also available. Delivered already stretched on a mount. Limited edition prints are delivered in a sealed, waterproof plastic sleeve and rolled in a cardboard tube. Would you like to own an original Perry Taylor? Some of Perry's original drawings are still available. If you are interested in an original of any of the reproductions that you see here on the site, please contact us for availability and prices. A signed dedication by the artist increases the value of a print. If you would like Perry to add a dedication to your reproduction, please write the text you require in the 'Comments' window when ordering a print. Keep your dedication, short and to the point, since only a single line of text is possible.